With the last few Topps Star Wars releases, Topps has treated collectors to some of the coolest and most cutting-edge trading cards around - SKETCH CARDS. The one-of-a-kind pieces of artworks, which are created by a team of well-known Star Wars artists, have become some of the most collectible cards among Star Wars fans and collectors. 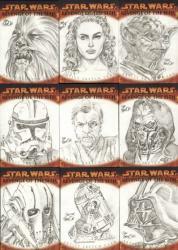 Topps is pleased to announce that it will once again offer SKETCH CARDS in its upcoming STAR WARS: REVENGE OF THE SITH product. Revenge of the Sith, which is the final Star Wars film, hits theaters this May. Topps Revenge of the Sith releases the week of March 21 and carries a $2.00 SRP for each 7-card pack.